With equities closing the week on a somewhat weak note, the VIX managed a third consecutive net daily gain, settling +1.3% @ 14.19 (intra high 14.91). 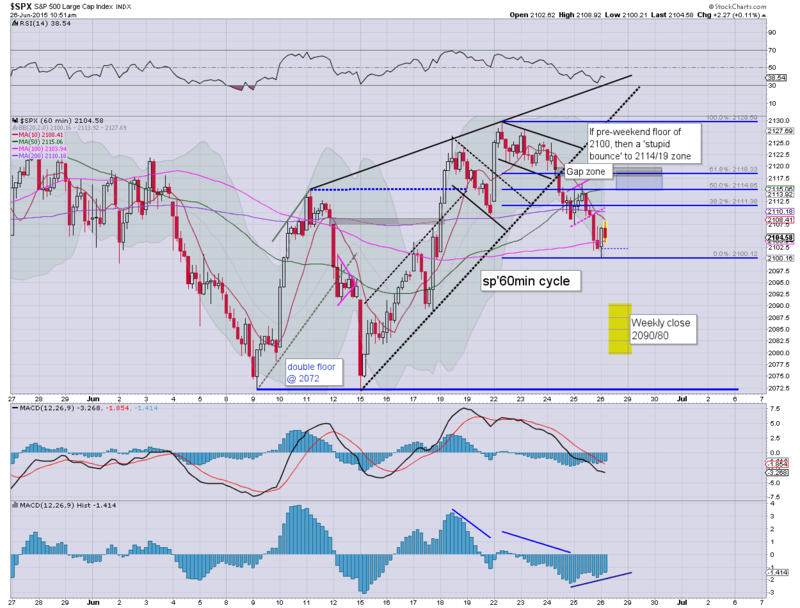 Near term outlook is for equity weakness next Mon/Tuesday, and if the sp'2060s, VIX should briefly trade in the 16/17s. The 20 threshold looks out of range. *a net weekly VIX gain of 1.6%. The closing hour saw a marginal break of the immediate up trend. Suffice to add, VIX remains bizarrely low, relative to the ongoing 'Greek situation'. Even the high teens would still merit as being overly low. As things are, a last minute Greek deal still looks probable next Mon/Tuesday, and if so.. the VIX will not manage the 20s in the current up wave. *I am long VIX (from 12.98), seeking an exit in the 16/17s. US equities closed somewhat weak, sp -0.7pts @ 2101 (intra low 2095). The two leaders - Trans/R2K, settled u/c and -0.2% respectively. Near term outlook is bearish for Mon/Tuesday, best downside case remains the sp'2060s, with VIX 16/17s. *closing hour was mostly chop.... but with certainly leaning on the upside. For the bears.... it was annoying, but the downward channel did at least hold. .. and another wacky week in the twisted US market comes to a close. Most had expected a Greek by now.... but no.. it is going to drag out across the weekend and into next week. My best guess? A last minute deal, late Monday/Tuesday... with the market rallying from there. I still fear some degree of multi-week rally across July and into early August, and until then.. I will be very cautious on any short side trades. *holding LONG VIX across the weekend, but I have Oct' calls.. and I'm not concerned about the ticking detonator clock. *the usual bits and pieces across the evening to wrap up the week. 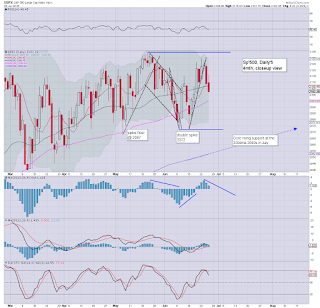 US equities remain leaning on the moderately weak side, sp -2pts @ 2099. Increasing weakness looks due into the close, as many will be understandably twitchy about holding long across the weekend. USD is holding gains of 0.3% in the DXY 95.40s. Metals/Oil are a touch higher. The setup for the closing hour is about as bearish as it gets... so.. lets see if we weaken to the low sp'2090s. Anything <2080 would be a bonus, but not that surprising, considering the unresolved Greek situation. updates into the close... especially if things unravel.. as I expect. 3.21pm... Well... nothing of significant yet on the sell side.... remaining within the down channel. Meanwhile.. King O' is getting blanket coverage during the closing hour. It certainly makes for a distraction from the various depressing news today.... never mind the ongoing Greek situation. 3.44pm... sp'2100..... time for the Russell 1k, 2k, and 3k to be rebalanced. 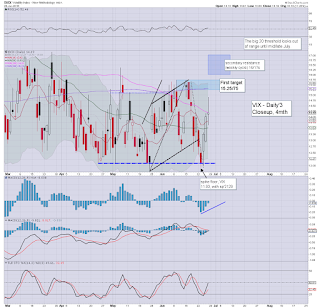 Bizarrely low VIX 14s.... am surprised we didn't see the 15s today.... close though. US equities remain within a near term downward trend. 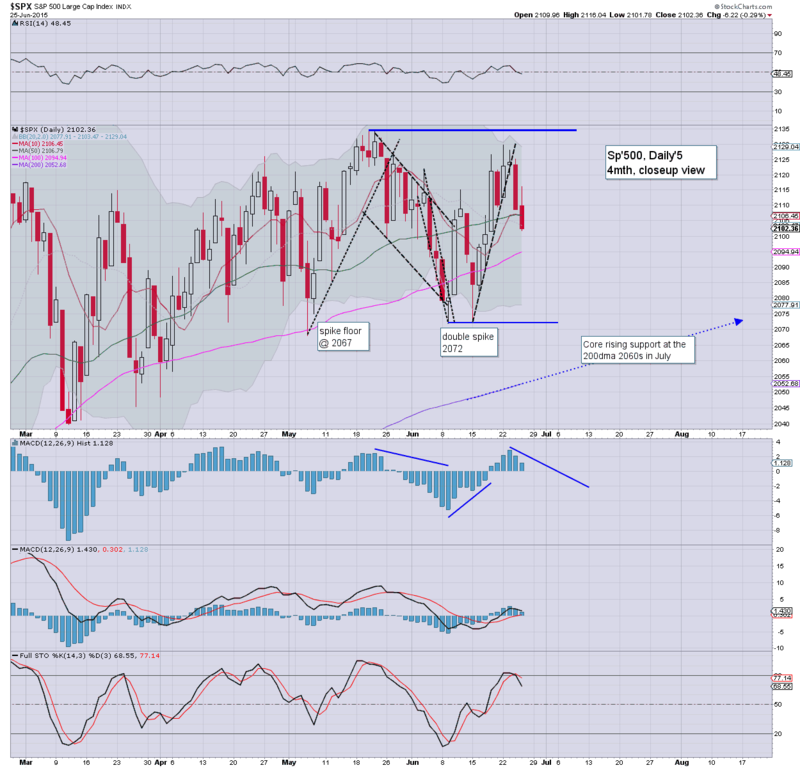 With the sp'2100 threshold having failed to hold, renewed weakness into the weekly close looks due. 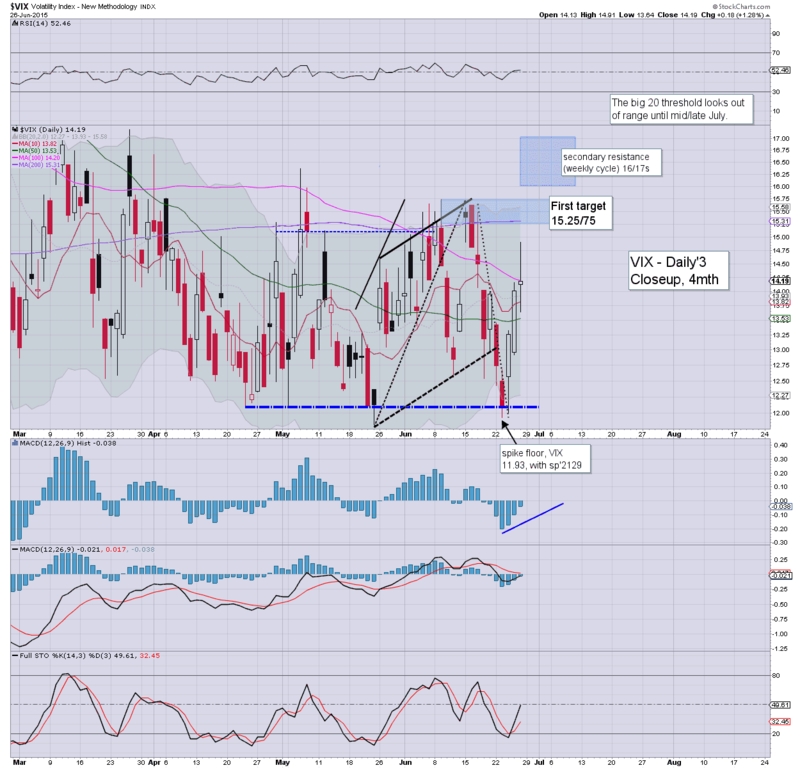 VIX is reflecting some increasing market concern, having made a new cycle high of 14.91. Suffice to say... more chop chop... with 2100 having failed... bears are currently in control. Based on trend/channel... a weekly close in the sp'2092/90 zone looks viable.. with VIX 15s. I do NOT expect the Greeks to agree on anything this weekend. More likely, they'll do arrange something Monday night/Tuesday. 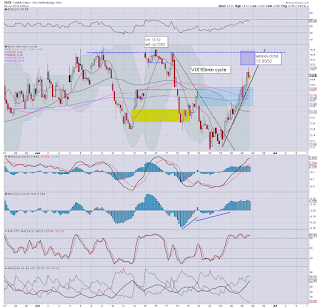 US equities remain on the key threshold of sp'2100. If the bulls can't hold the line, there is empty air to the 2090/80s by the close of today. 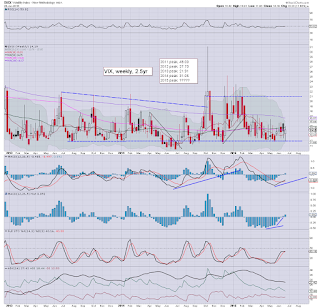 VIX is reflecting increasing market concern, +3% in the 14.40s. Broadly, the daily/weekly cycles favour the bears.. even if a 'dumb bounce' to 2114/19 zone. So.... a break of 2100 or not? Really tough to call today.. it remains a bit of a mess. If I had to call it.. I'd say weakness into the close.. to 2090/80. It remains a case of 'who wants to hold long into the weekend?'. 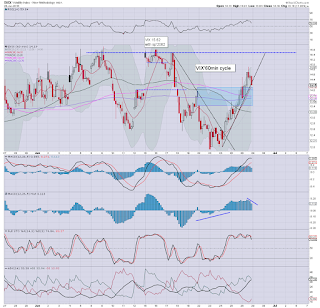 notable weakness: INTC -3.3% in the $30.90s... for me, it remains a viable proxy/indirect signal for the broader market. 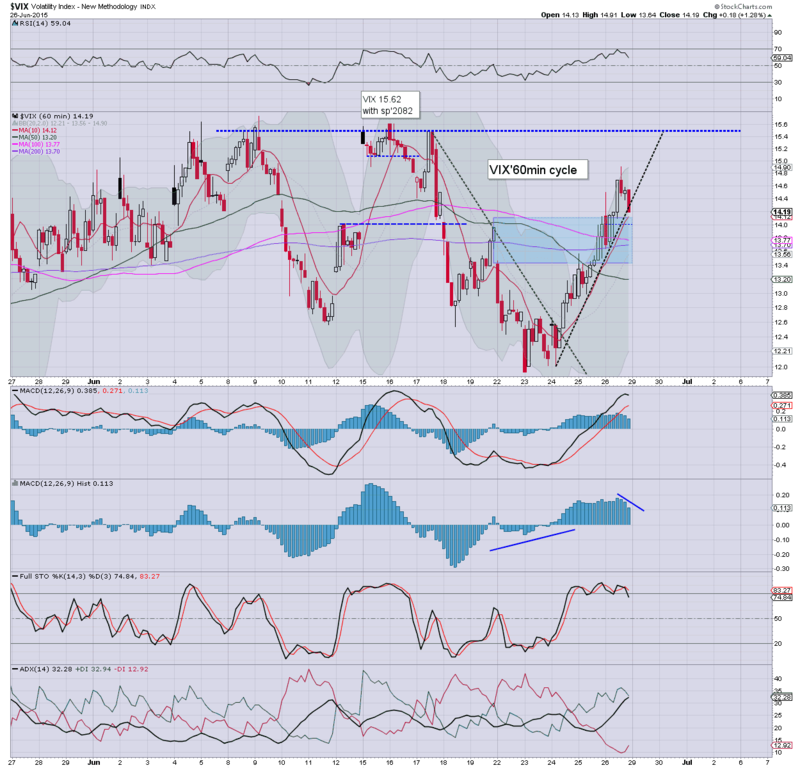 strength: DE, +3.5%, having broken out of a tightening range since 2011. First target is the giant $100 psy' level, with 125/130 next year. 1.15pm.. Indexes slowly unravelling.... with VIX 14.70s... the mid/upper 15s are viable by the close. Considering the Greek situation, VIX remains bizarrely low. At best.. maybe 16/17s next Monday. US equities remain in moderate chop mode, with the sp' battling to hold the 2100 threshold. It remains a twisted market, with threat of upside to the 2114/19 zone... unless 2100 is lost this afternoon. 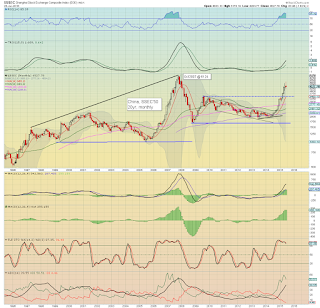 USD is holding gains of 0.4% in the DXY 95.50s as the market is naturally concerned about the Greece situation. It is clearly a very borderline situation. If 2100 fails... there is open air to 2090/80 zone by the close. Otherwise.. viable upside to 2114/19.. where there will be multiple aspects of resistance next Monday. *If market does somehow manage rally into next Monday, then I'll just re-add on the short side. As it is, I'm more than content having exited INTC-short at the open. US equities are battling hard to hold moderate gains. 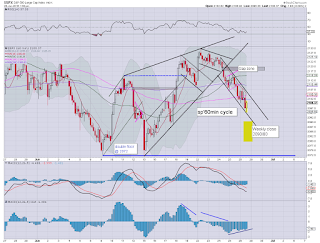 The sp'500 is offering a short term floor of 2100, with viable upside to the 2114/19 zone.. before renewed downside. In any case... daily/weekly cycles remain leaning on the bearish side. Considering the threat of 'Greek issues' over the weekend, it is going to be damn hard for the market to hold the current gains.. never mind build them into next Monday. As it is... there is viable upside to the 2114/19 zone.. where there is a minor price gap zone of 2117/19. Under no reasonable outlook do I see sustained action >2120...before the 2080/60s. *I remain long VIX... am in no hurry to exit that one. 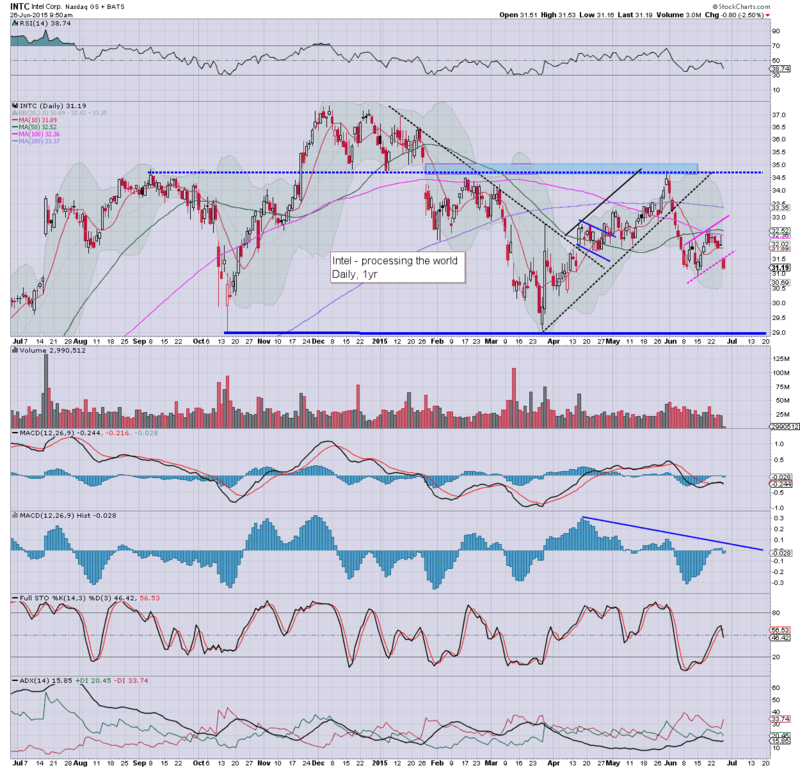 I'll keep my eyes on INTC.. in case the maniacs can somehow bounce it significantly... but that won't be easy. US equities open a little choppy, but leaning (naturally) on the weaker side. The sp'500 has already tested the 2100 threshold, with a new VIX cycle high of 14.50. Regardless of today, market looks very vulnerable into early next week...irrespective of whatever the Greeks do.. or don't do. Somewhat messy start to the day... as many are wondering... just what the hell is going to happen into end month. Seriously though... who wants to go long across the weekend? From a pure cyclical perspective, the daily and weekly cycles are currently bearish... and increasingly so. Bear flag on the daily chart has been confirmed though... it remains a short... to the 30/29 zone. Late summer target is 26/25. In any case.. I'm content... will probably re-short on any bounce. notable weakness: coal miners, BTU -11.5%... the week of horror ending... horribly. VIX turns negative. 13s.... crazy level. 10.35am.. It remains a choppy mess. Are we getting a 'stupid bounce' into next week... or is this just a tease to the bulls... like yesterday? Good morning. Futures are a little higher, sp +4pts, we're set to open at 2106. With the Greek situation remaining completely unresolved, a significant net daily decline of 25/30pts looks due.. whether today.. or on Monday. 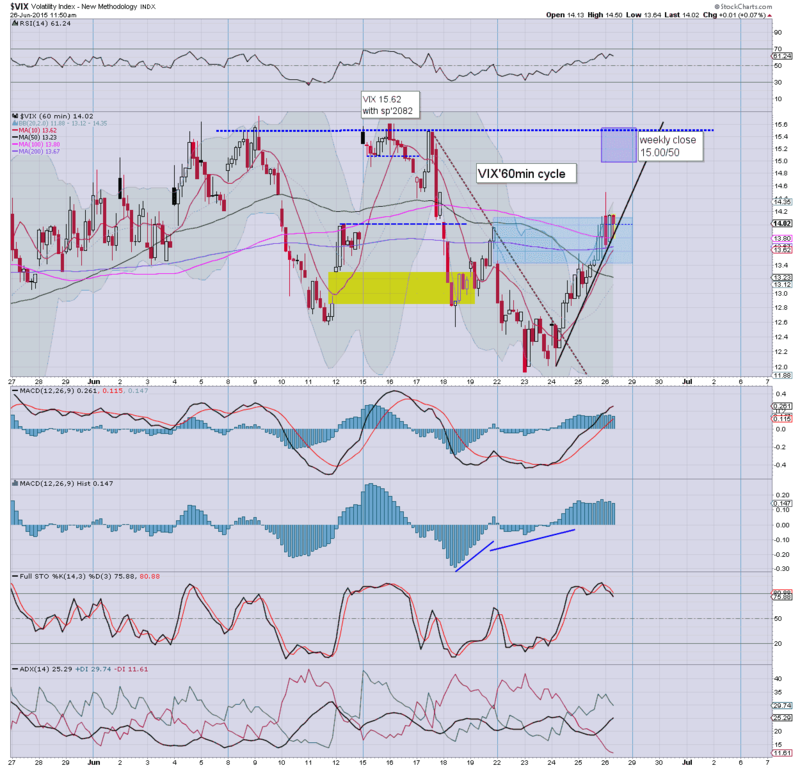 The USD, metals/oil are broadly flat. We have a very interesting day ahead. The past two consecutive days have been lower, but clearly nothing significant. 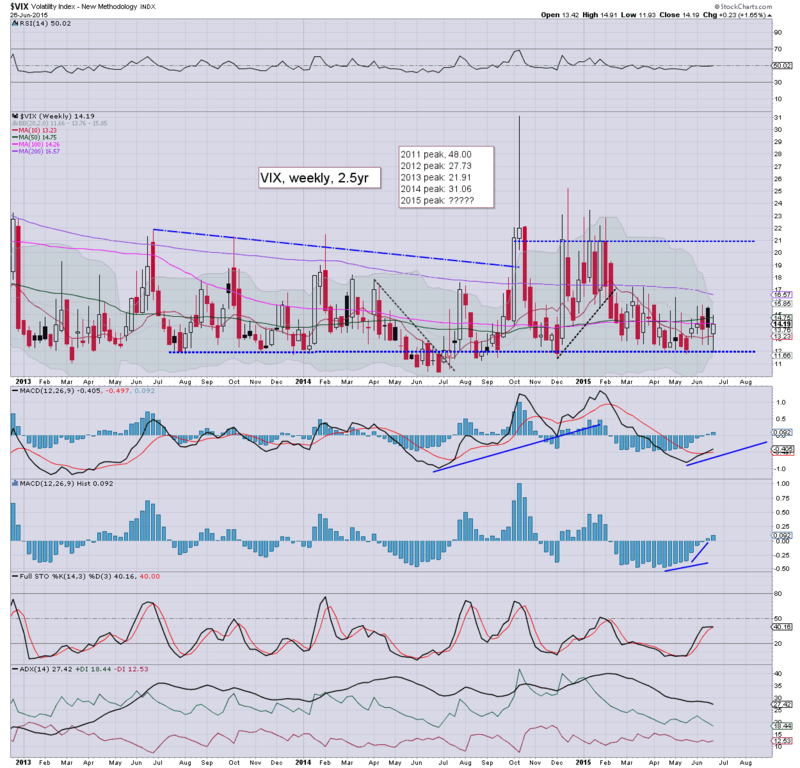 Daily MACD equity/VIX cycles are liable to turn negative/positive respectively today or Monday. There is HIGH probability of a major down day... before the next wave higher. 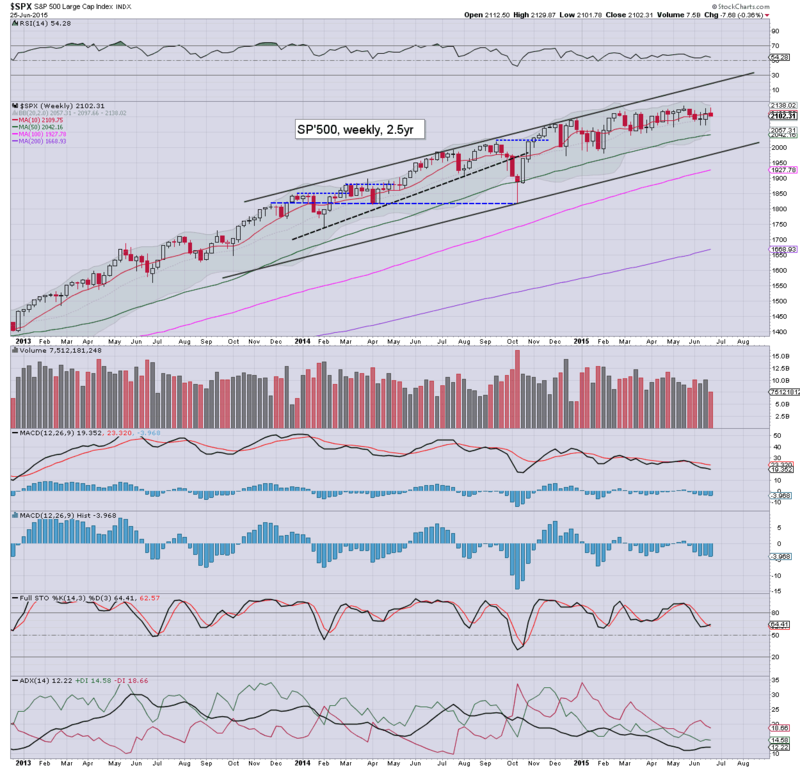 A net weekly decline looks due... with a weekly close under the 2100 threshold. 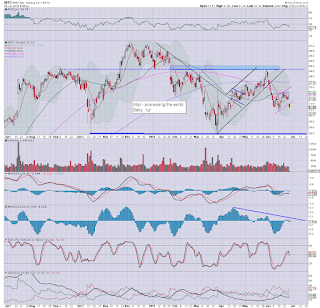 notable early weakness, INTC, -1.2% in the $31.60s. .. that is a rather pleasing sight to yours truly... right now, I'd prefer an exit around $30.50.. but that is out of range today. If I can get 31.25/00 by late today.. I will probably exit for the weekend. strength: NKE, +3.4% in the $108s.. on rather good earnings. 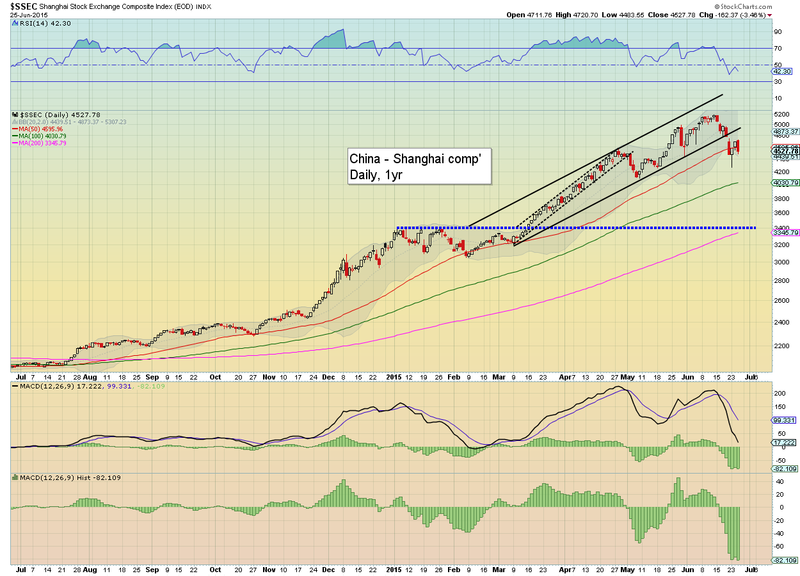 Not surprisingly, China saw another wacky session, this time settling -7.4% @ 4192. As I noted in the previous post, the 3400s remain a rather obvious target for those with eyes on the broader picture. Mr China retail amateur is probably going to have a rather sleepless weekend. I don't envy them! 8.23am Indexes cooling a little... sp +2pts... 2104..
.. and that is a problem for INTC, -1.9% in the $31.30s... I did see a print for $31.00 earlier.... I'd settle for that today! 9.34am.. EXITED INTC-short.. .from $31.25..... am very pleased... will likely re-short on any 'stupid bounce'. 9.43am.. minor declines in most indexes.... after all.. who wants to buy into the weekend? Whilst US equity indexes closed lower for the second consecutive day, the China market continues to see strong price swings. Price action and structure is bearish unless new highs are broken in the very near term. 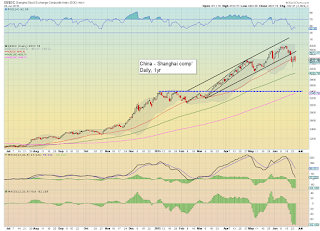 Broad downside to the 3400s remains a very serious threat into the late summer. The retail amateur in China must be getting a little dizzy with the ongoing price swings. 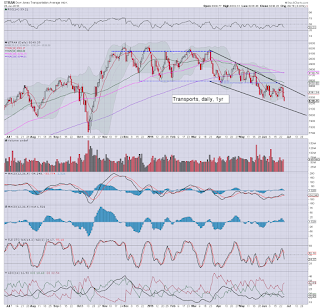 More sustained downside looks very probable into the late summer, back to the breakout level of the 3400s. 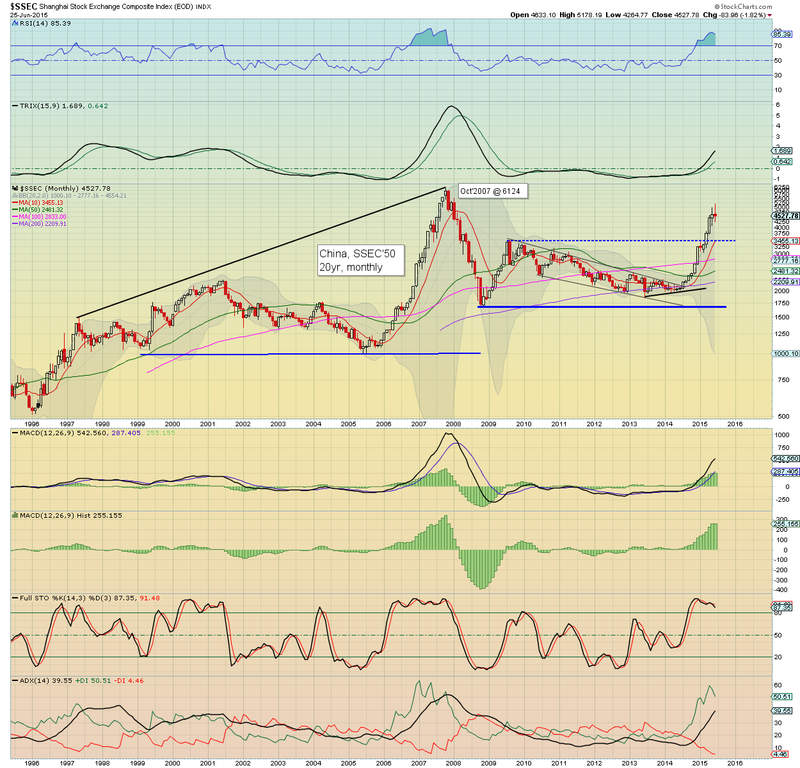 The only thing that would negate the immediate bearish outlook would be new historic highs (> 5178). 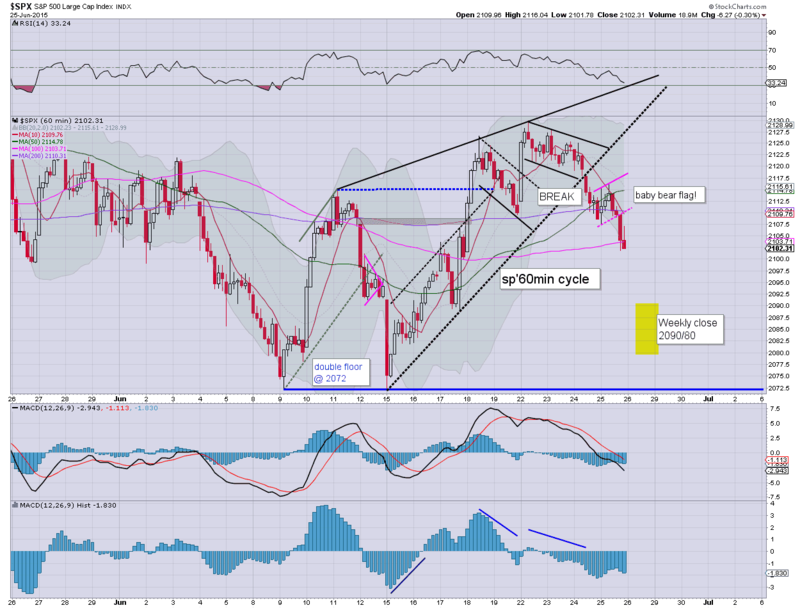 Friday will see consumer sentiment, but market will be infinitely more focused on the building Greek situation. US equities closed broadly weak, sp -6pts @ 2102. The two leaders - Trans/R2K, settled -0.8% and u/c respectively. Near term outlook is very bearish into the weekly close, with viable further downside to the sp'2060s - with VIX 16/17s next Mon/Tuesday. 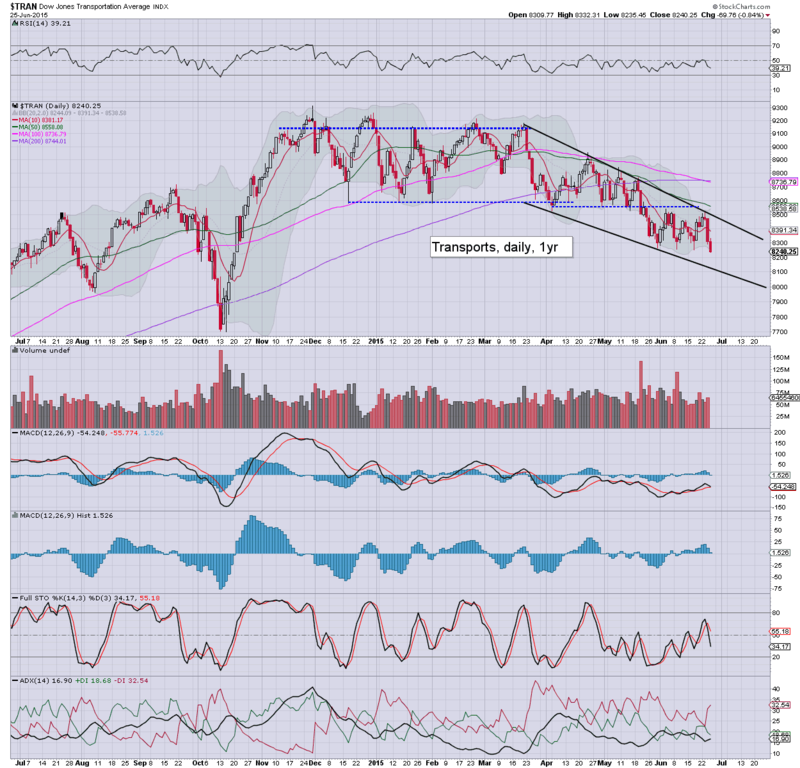 *Trans continues to be the market laggard.. looks headed for the 8100/8000 zone... with secondary late summer downside to the Oct' low of 7700. 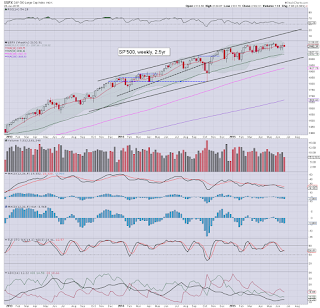 As for the sp'500, a weekly close under the 2100 threshold looks extremely likely. I am guessing Friday will close somewhere in the 2090/80 zone.. along with VIX 15s. Daily MACD (blue bar histogram) cycles are set to turn negative tomorrow... or certainly.. by Monday... and that bodes well for the equity bears for at least another 2-3 trading days.